Resolved: I Will Come Up With Resolutions – Hey, Look! A Writer Fellow! I’m not one for New Year’s resolutions. I’m not even one for staying up until midnight on New Year’s Eve (I was singing “Auld Lang Syne” to my pillow at 10:30, thank you very much). But something tells me that 2015 is going to be my year. My problem is that something tells me this every year – and that something is rarely right. So I figured I’d throw in a little New Year’s resolution self-improvement to karmically sweeten the deal. My first resolution is for my beloved wife. Resolved: I shall neither form opinions nor comment on the opinions of others until I have finished at least one big mug of morning coffee. This is what 376 golf balls look like. If you want to see what a doofus looks like, check out the photo at the top of this blog. 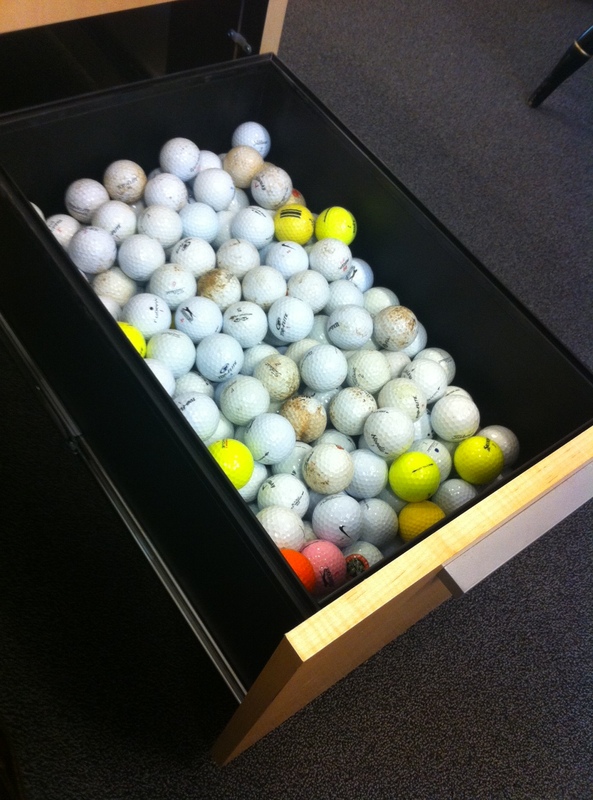 Resolved: I will get rid of my golf ball collection in a manner that is – at the very least – mildly amusing. Since I started this blog three years ago I have broken bread with five blog pals and met at least a dozen more. I am delighted to report that every single one of them was funny, charming and interesting. I am still a bit gobsmacked by this. Seriously, what are the odds? Maybe I’m tempting fate, but I want to meet more! Resolved: I will meet more blog buddies in person. In other words, if you reside in or visit New Jersey, New York City, or Eastern Pennsylvania, feel free to hit me up for coffee. I nodded to Liz, as I usually did, and resumed my folding. After a few minutes, I realized that the laundromat was unusually silent. I looked up from my work to find both Liz and her meathead staring at me as if I was some kind of circus animal. “I bet you iron, too,” Liz said with a contemptuous smile. It was at that moment I could see Mr. Meathead’s brain drawing conclusions about my sexual identity. Since those days, my laundry muscles have atrophied. I still do loads without having to be asked, but washing my wife’s clothes have made things more complicated and intimidating. (Delicate cycles? Wha?) At times I feel like a babe in the laundry woods. Resolved: I will become a Laundry Master. Resolved: I shall write early and often. I already sort of do this. But I plan to write earlier and often-er. And with more gusto. I also want to get my word counts up. Rebekah, one of my blog pals, banged out 14,000 words in one day for NaNoWiMo. Let me say right here and now that I have no plans to challenge this record. Resolved: I will do something bold, yet well-planned. I can’t do bold without my boldness being well-planned. And yes, I already have something planned. ‘Cause that’s the way I roll; I plan my planning! So! What are some of your resolutions? I can’t wait to see what your bold thing is. I was also hoping for a resolution to get on twitter, ’cause I feel like your humor would translate so well there. And I would follow you, so I could laugh. Well, I never say never, but as far as Twitter goes I can say with confidence, “Not this year.” I can barely keep up with the (admittedly limited) social media stuff I do now! I haven’t made any resolutions because a) I’m not good at making them, and b) I’m beyond horrible at keeping them. Now with regard to the golf balls, I wonder if there’s a pro bono org in desperate need of them, e.g., some org that recycles, etc. If only they had been tennis balls, my dog would have volunteered to take them. Happy New Year! Dang! Who would thought it would be so tricky. I could always drive them into the ocean like Kramer did on Seinfeld. And I’d love to give your dog a toy, but tennis balls do not neatly fit in pants pockets. Sounds like my kind of dog. Mine are here, but you knew that. No way! That’s great! Oh, do post a pic when your phone case comes in! Oh, something tells me this is your year. I’m still working on my list but I doubt it will be as clever as yours. I had a couple of ideas but somehow between New Year’s Eve and New Year’s Day they got lost. It’s probably better that way. You lost all of your resolutions between New Year’s Eve and New Year’s Day? Perhaps a resolution on your new list should be “stop drinking”. We had an accident in the family around 7:30 pm New Year’s Eve and we spent New Year’s Day in a trauma unit. I guess the worry wiped away my resolutions. Did lots of praying, though. The good news is my family member moved to ICU within a couple of days and out of ICU yesterday. No brain damage, no paralysis, just a lot of painful rehabilitation ahead of him. Dang, Michelle, I didn’t expect you to have a story like that! I thought you were telling a drinking joke! Here’s hoping your loved one makes a quick and complete recovery. And, yes, by all means, take a swig or two! Take care and be well, my friend. To read your blog early and often. Also, does your wife have any advice on finding a guy who does laundry? What a lovely resolution to have! As to your question, the key is to look at a fellow’s appearance. Are his clothes tidy? If so he is either a Laundry Master, married, or lives with his mom. Good luck figuring out who’s who! Wow! Find a place that buys used golf balls and at 5-10cents apiece you can fund a few of those coffee meet-ups. Laugh silently or toast to all those who lost the balls if you need mild amusement. Amusing, practical and lucrative. You have quite a head on your shoulders, Wendy! I think you just earned a free coffee! Can’t wait to hear what bold thing you are planning to do. My husband has always done laundry. Wouldn’t marry a guy who didn’t. I do know that I enjoy visiting your blog because I always leave with a smile. Wish I could meet you, but I live in Ohio. The boldness will happen soon! Mwah ha ha! Does your husband know the delicates cycle and the art of stretching sweaters? If so, perhaps a visit to Ohio is in order. We might just break bread yet! I’m thinking a space elevator. Send the golf balls to Mars. Similar to the feeling I have that you AND I are going to have a GREAT year, I have this vague sense that Martians might think golf balls are tasty morsels. As far as the laundry people are concerned, that woman and her BF are probably doing time somewhere right now, folding prison laundry to government specs. However, I do feel a tiny bit sorry for that clueless woman. As a Californian, I feel discriminated against. Maybe you could get your behind out here for an SCBWI conference on the West Coast? As a fellow writer, I am drawn to your writing resolution, but as far as your “doing” resolution is concerned, I can only subscribe to BOLDNESS. Planning was never my forte. You feel discriminated against? How do you think I feel? Not only are some of my very best blogging pals out in California, but I’m stuck here in New Jersey! You might have something with the Mars idea. Astronauts drove golfballs on the moon, why not The Red Planet, as long as they don’t whack the rover, all should be fine. Your golf ball idea intrigues me, but it does not provide me with the visceral joy of, say, rolling them all down a flight of office stairs. After I become a black belt Laundry Master, I shall continue my training to attain the rank of Laundry Ninja — whereby, as if by magic, empty sock drawers become full again. I’m resolved to figure out how you got those resolves corralled so neatly in those boxes. Boxes. Are you referring to the post’s formatting? Well, t’anks. It’s the “Blockquote” button (the quotation marks) on the New/Edit Post page. See, there’s the problem–I’m a classic mode kind of muser and haven’t sniffed around that new fangled upgrade yet. I hate to break this to you, Cricket, but it ain’t new. I’ve been blogging since 2011 an it was here when I got here. You’d better do a few WordPress tutorials! There’s a whole world out there and you’re missing it! And I thought I had hit paydirt when I discovered I could change font and colors. The problem with resolving is that I don’t save it for a special day like New Years…I’m a chronic resolver…and planner, too! I would like to repay off a long term debt to a family member aka fairy godmother who has never quibbled about how long it has taken me to repay the money, accepting my pay as I can status cheerfully, if you can believe that. I’m sure I will sleep better when this one is completed. I would like to publish a children’s book this year. You and I will definitely have some face time this year…count on it! I’ve got about five years of research on family history scattered in various locations in my office. Before I do any more research, I have got to sort, organize, layout and compile what I already have so that someone else could pick it up and find it a useful tool. I also want to take more painting classes and maybe I will even work out my own painting style this year. As for golf balls, my relationship with golf is even less than yours except there are LOTS of golf courses in Florida. Perhaps if I took my walks on the golf course that is three streets east of my house I might find some golf balls as well and if I worked real hard, I might be able to catch up with you by the end of the year. Fine resolutions all — especially the face time one. I look forward to meeting you! I decided to avoid the “get a book published one” on my list because it is too dependent on the actions of other people and, take it from me, that can be frustrating. I resolve not to resolve which is a breakage of said resolve… LOL! I don’t do New Year’s resolutions because… well… they just don’t work out for me. I have never had any success with them therefore I do not set myself up for failure, right? Anyhoo… I try to set goals in general and be better at them each year and try not to wait until Jan 1 to make changes. If things need to be changed, why wait until Jan 1 to do it? Right? Just nod your head and agree…. HA HA! Yes, yes, I see your point, Courtney. And a fine point it is! Yes, indeedy! Wow, you’ve met a lot of bloggers! When are you coming to England then huh? I’m sure there’s some great art-based idea you could use the golf balls for. Ooh, ooh, I know! If you find a type of paint that adheres well to them, maybe paint one a week in a way that represents the highlight of that week, or if not paint, then permanent markers would do. That’s a great idea of mine isn’t it! Like I did my year in 365 words, you could do your year in 52 balls. Today is the 7th, so you must start quickly! Hurry! Ellen and I have an ongoing back and forth about which overseas country to visit. She leans toward the Mediterranean and I fight on behalf of the marvelous accents and boiled meats of your fine country. Here’s hoping I will eventually prevail. That said, you could come visit me, too, you know! You’re not the first person to suggest painting the golf balls. Unfortunately, they are not a very good substitute for a canvas; aside from being reeeeally small, those things have hundreds of divots on them. Maybe we can compromise and meet in the Mediterranean, that way everyone’s a winner! (Assuming I bring my marvellous accent and some boiled meat of course). I think a fairer compromise would be to meet in the middle of the Atlantic Ocean. I like my boiled meat salty. I’m speechless, partly because I’m still smiling at your laundry/golf ball/writing-early promises, but also because resolutions make me speechless. They’re scary, and I’ve never allowed myself the challenge of making one (much less SIX). But this year is different. If you can resolve to become the Laundry Master and to write EARLY, I resolve to begin writing even earlier. In the past you’ve challenged my sanity of staring at my computer screen with my tea by 6:30 every day. Well, this year, I’ll be working away by 6:00 AM. And if you were on Twitter, we could even greet each other with a Tweet at 6:02. Now how bold would THAT be? But you could help me out with my “meeting bloggers” resolution. I know you periodically skulk around New Jersey trying to avoid me. I would LOVE to help you with that resolution. Now that I live in the Boston area, it may be easier. If you come up this way, please let me know! We could meet ‘where the shot was heard round the world.’ I know a great coffee/tea place nearby. Otherwise, my skulking NJ days occur in the summer, and I’ll keep you apprised. Oh, right! I was thinking you were still a California gal. We must make this happen! Tragic accident. Please don’t stare. Hiding them around the house sounds a wee bit cray-cray. But I try never to say never. And bring the golf balls….there is a driving range across the road!! If you think I’m lugging 376 golf balls to Ontario, you’re crazy. How about “a few putts short of a birdie”? How I wish I had found this blog sooner! It seems I came late to the party. I decided to go with only one resolution this year – I resolve to put action to my dreams and ideas. You’re never to late to the party. Welcome, Roxie! Here, have a cookie! Hmmm..this seems more you (from what I’ve read-and seen in that pic) http://www.huffingtonpost.com/chris-barnes/repurposing-ideas-new-uses-golf-balls_b_1952116.html Sorry, still troubled by these golf balls, seeing all 376 of them in a drawer. I’ll go away now. I do believe that if I begin to decorate my house with golf balls my lovely, patient wife will murder me. I have no plans to visit Scotland, I am sad to say. Perhaps we could meet for coffee halfway? Where would that be? Iceland? I dig it. See you soon! To enjoy a few other blogs and not be concerned with having one myself. 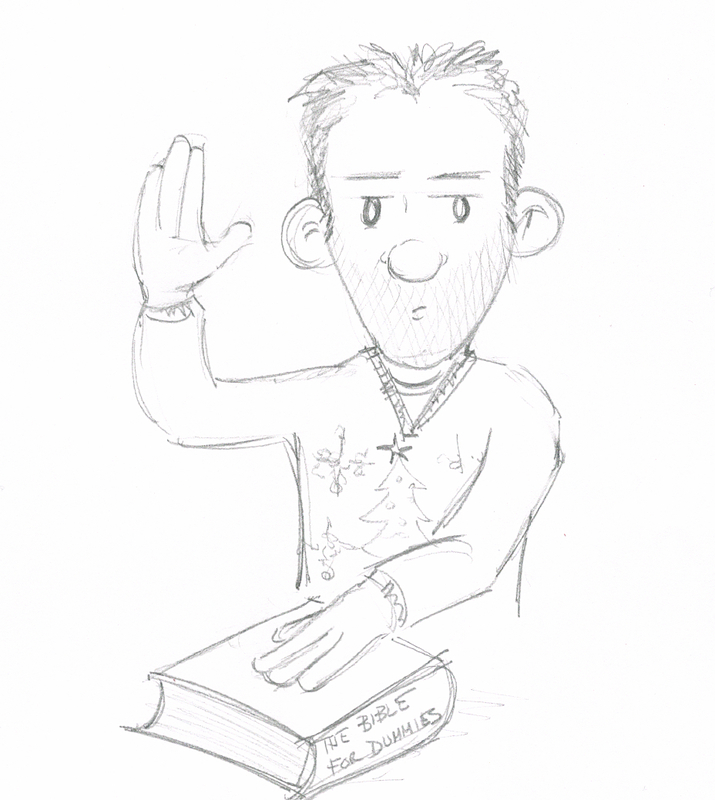 I need to return to my writing and my blog sometimes overtakes that. Amen to that. Blogging sure knows how to rob you of your writing time. So! May your writing be especially prolific in the new year! Love the notion of planning your planning. I do that all the time. And 14,000 words in one day for NaNoWriMo?! Wha-at? The highest I ever got was 4200 … Maybe I need to plan more. Welcome, Karen! I like your blog! I regard to your comment, no, you don’t need to plan more to get your word counts up; my pal Rebekah is nutty. Admirable goals for 2015, Mike! I have yet to meet any blogger buddies in person, but I’d like to change that this year. There are a couple in Seattle that I’d like to hang out with finally. I imagine it’s pretty surreal, but of course, pretty awesome. I really like chatting with fellow bloggers in person. I think you’re gonna dig it. Are you suggesting I come up with 376 dramatic ways to get rid of these golf balls? I’m having a hard time coming up with one dramatic way! As per your request, I shall not tell you that I am not bold. Many thanks for referring me to the forgotten bookmarks site! I am a new follower. Perhaps one of these days our paths will cross, Stacy. I sure hope so. But I can assure you that when we do, I will not be ordering water or Sprite. Meet ‘n’ greets need coffee. Those are great resolutions! I used to love breaking open golf balls with a hammer with my dad. I highly recommend it. I don’t know if the technology has changed in the last 30 years though – maybe there’s like Mars dust or something in there now. While strolling the golf course, I have come across a lot of cracked open golf balls. It turns out golf balls are actually caddy eggs. however I have a habit for making short term resolutions, and last year was one good one in this regard. 1)drastically turned around my extreme night owl sleep patter. 3) Healthy eating, regular walks. and currently focusing on temperament, I flare up rather quickly. I admire you. Sleep patters are notoriously difficult to readjust. At least they are for me. My rational brain knows I should go to bed earlier, but my creative brain wants to use that time to come up with a new story. I always defer to my creative side. In attempt to keep my sanity, I have chosen a life changing resolution. I am going to focus on myself. I have begun yoga, minor mediation, next week marks a new diet and work out plan and I have begun a journal. Thus far I have learned that I am no Buddha, neither am I the flexible dancer I once was and I am already mourning the cheese and fat that will no longer reside in my kitchen. My resolutions tend to need a resolution.